God knows us. Habituated as we are to life in a huge universe consisting of nothing but particles and fields, that comes as a shock. When God reveals himself, we are startled to discover: I am known. God knows each cell, each breath, each thought, and my every flicker of fear and desire. “I have been fully known,” says Paul. 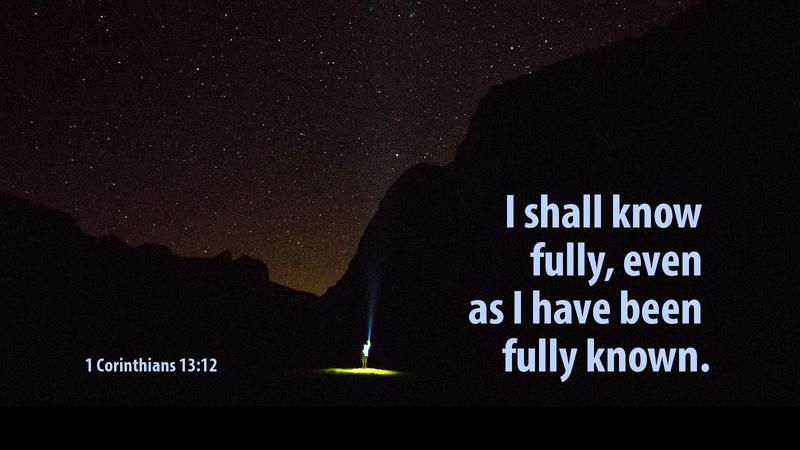 But he also says, “I will know fully…” And he makes the fullness equivalent: I will know God as fully as he knows me. Paul is speaking of eternity, but even so, is this possible? God is infinite. The knowledge of God is infinite. But Paul makes it sound as though fully knowing God happens in a glance. Even in heaven, what at a glance could show us all of God? Maybe something on earth. When I am resurrected, will I stand beneath the cross and have the courage to look up? All my life, I averted my eyes. But in glory, I will see in his eyes all the love that has always loved me. Meeting the eyes of the crucified Jesus is seeing God face to face. Prayer: O God, give me courage to look into your eyes. Amen.